To Improve Transportation, More Private Sector or More Federal Involvement? There are some remarkable stories of the private sector showing initiative when governments fail to maintain infrastructure. In response to dithering by government, residents and businesses in Hawaii put up $4 million to fix an important community road. Smugglers in Russia repaired a road to facilitate untaxed trade between Russian and Belarus. I also wrote about a guy in England who was fed up with the slow pace of road repairs and built a private toll road. Regarding the final example, here’s a video on his project. I’m particularly amused that this example of practical libertarianism (I’m guessing without the cost overruns that are inevitable with government) was made possible because zoning laws (normally an obstacle to sensible land use) basically allowed the organizer to ask for forgiveness afterward rather than permission beforehand. To be sure, these isolated examples are hardly a sign that infrastructure is going to be privatized in the United States. But maybe we can at least learn a lesson on whether we should have more centralization and control from Washington, versus more decentralization and private-sector involvement. Regarding the former, Chris Edwards explained for FEE that the federal gas tax should not be increased since politicians impose taxes for the ostensible purpose of building and maintaining roads, but then they divert the money to other programs that buy more votes. …a federal gas tax increase makes no sense. State governments own America’s highways, and they are free to raise their own gas taxes whenever they want. Indeed, 19 states have raised their gas taxes just since 2015, showing the states are entirely capable of raising funds for their own transportation needs. …Also consider that gas taxes used to be a more pure user charge for highways, but these days gas tax money is diverted to inefficient nonhighway uses such as transit. …About 20 percent of those funds (about $8 billion) are diverted to transit and other nonhighway uses. …In 2016, state governments raised $44 billion from fuel taxes, and they diverted 24 percent—14 percent to transit and 10 percent to other activities. …The states also raised $38 billion from vehicle fees. They diverted 34 percent of those funds—13 percent to transit and 21 percent to other activities. Regarding the latter, the City Manager of Milford, Delaware, wrote a column for the Washington Post about benefiting from private financing for road repairs. 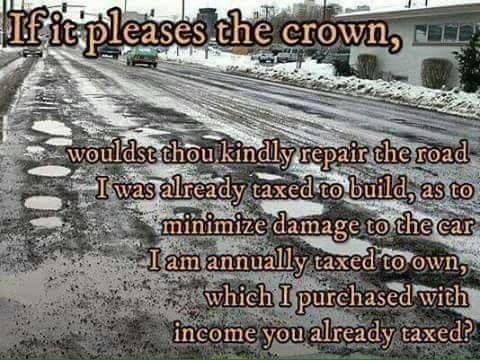 …when I heard that a Domino’s marketing campaign was paying municipalities to repair potholes in return for credit for the work, I quickly responded. …Our role was easy. In exchange for a $5,000 check, Domino’s wanted its logo and a tag­line saying “Oh yes we did” in spray chalk on the road next to each repair. …In two weeks, they fixed more than 40 potholes of different sizes — about 20 to 25 percent of the potholes that appeared after the winter. …The program has elicited some complaints about what it means that a pizza chain is funding basic government projects. …But we saw this as a great idea for our community. …In many communities, there’s a constant competition between paying for police and paying for everything else. …if we demonstrate good stewardship of our resources, then hopefully fewer people will complain about paying taxes. …sometimes that means letting Domino’s pick up the tab. Incidentally, sometimes “anarchists” decide to fix potholes without even waiting for permission. Let’s close with some libertarian-themed humor. 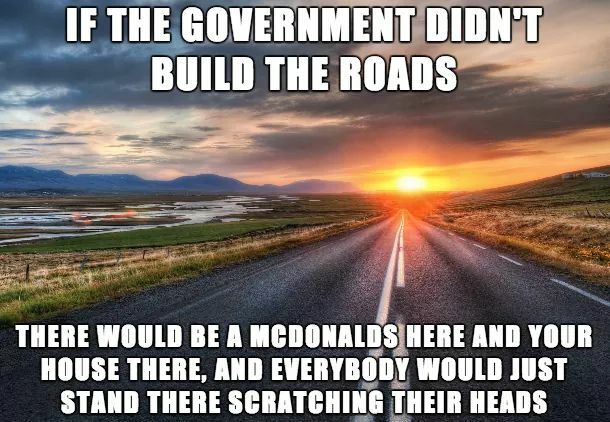 Some people apparently thing that roads wouldn’t exist in the absence of government. This is an anti-empirical sentiment since many of the first main arteries in America were private roads. And we still have private highways being built today. Not to mention plenty of neighborhood developments and office parks (or even stairs) that are examples of privately financed and privately maintained infrastructure. Yet there are still doubters, so this sarcastic image is for them. Speaking of sarcasm, this next image is a clever combination of two concepts. First, politicians have an insatiable appetite to tax us over and over again. Second, they don’t fulfill the responsibilities that they claim only government can handle. The bottom line is that Washington should have no role in infrastructure. And even if you think infrastructure should be handled by state and local government, that definitely does not (or should not) imply a large public sector. P.S. 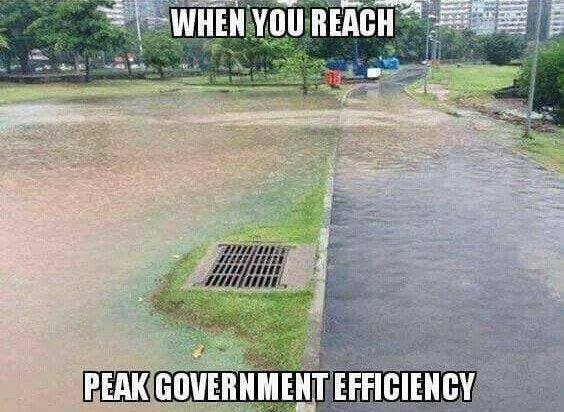 Here’s some more libertarian-themed infrastructure humor. P.P.S. To be balanced, libertarians can be mocked because of our disdain for public goods.